To determine whether a residential well needs cleaning, most homeowners will contact a specialist well firm to conduct a dry weather test. These tests, typically around two hours in duration, are used to determine the water quality and water rate production of a well. They are used for real estate transactions as well as for general maintenance purposes. Here are the four tips. The first step in determining whether a well needs cleaning is to conduct a two-hour production rate test. This uses a water level sensor and a water meter. Pumping a well for two hours allows the operator to determine the condition of the pump equipment, the bladder tank, the electrical system, the plumbing and the filter. The test involves running the well for two hours to determine the production rate of the well. A slow rate could indicate that the well is blocked or dirty and requires cleaning. The water meter is a dial in the water line that measures how many gallons of water are being pumped from the well at any given minute. In conjunction, a floating sensor determines the water level. The idea of a 2-hour test is to draw the water down, determine the production rate and determine the rate at which the well is recharging. A slow rate of recharge could indicate that the well would benefit from a clean. Most people let the discharge from the well run into a bucket during the test. This is where you can monitor the clarity of the water and see whether the water is discharging sand. Things that you cannot see in the water should also be tested for. You should conduct a test to check for contaminants such as bacteria, do an arsenic test and check for nitrates and minerals. These tests will measure the hardness of the water, the pH and alkalinity and show the presence of partially dissolved solids such as iron and manganese. These tests will give you an idea of whether the water is potable. A high concentration of particulates could indicate that the water well requires cleaning. Most home well systems use a filter to sterilize the water. One portion will house a UV light bulb and one will house a cartridge filter that removes heavy minerals and bacteria from the water. There may be dissolved elements in the water but any sand, sediments or particulates should be filtered out. Check the expiry dates on the filter cartridges and look at the condition of the cartridge. A significantly blocked filter could indicate that the well needs cleaning. According to one supplier of well water filtration systems, regular testing is required to determine the condition of a well. Most homeowners hire specialist firms to conduct regular testing. This ensures that the water remains potable and that nobody who drinks for the well experiences any harmful side effects. What do you think of our four quick tips? What did we miss? 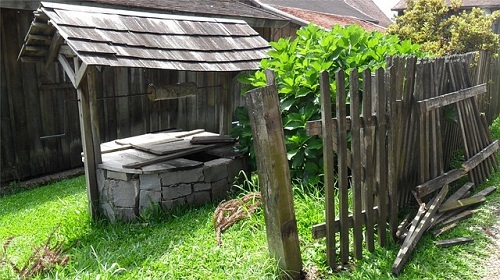 If you have a well, let us know how you determine whether it needs to be cleaned!